The 14th Annual Cycle NC Coastal Ride once again rolls into Oriental where locals will be welcoming 1500+ bikers to our little town, April 28th, 29th and 30th. Cyclists will be biking throughout the county each day, and after burning up the road, they’ll come home to base camp in downtown Oriental. And AP is on the map! 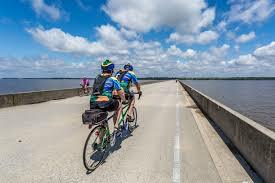 Cycle NC has chosen Arlington Place to be PIT STOP #1 for cyclists in need of quick break. The Welcome Center at our entrance will open and ready to serve up snacks, drinks, tunes, bathrooms and a crowd favorite, PB&Js! We’re excited that we get to share the springtime beauty of our area with so many people from across the country, backyard surroundings that most of us take for granted. Want to be part of the event but aren’t quite ready to dust off that bike and ride for hundreds of miles? We’d love to have some volunteer help at our pit-stop station to make sure everyone is hydrated and fed before they hit the road again. Email peyton@arlingtonplace.com for time slots on the 28th and 30th. The end of April is a great time to visit our area. Fingers crossed for (more) pretty weather AND Arlington Place will have 4 open houses, Sautrday the 29th and Sunday the 30th from noon till 5:00 in this year’s Parade of Homes! Lots of happenings in April and May….Oriental Boat Show, Parade of Homes, 5K Color Run, Cycle NC, Mariner 5K and plenty more. Stay tuned to our BLOG and FACEBOOK pages or check out our CALENDAR OF EVENTS for more info. Sounds like it’s time for you to get roll’n!